"Connoisseurship and Good Pie: Ted Coe and Collecting Native Art"
Native American art has always a difficult time in museums. Historically, it was collected by natural history museums that mainly appreciated its ethnographic significance, rather than its aesthetic value. Most art museums paid it little mind until fairly recently and even today it is, with few exceptions, a low priority for them. Over the decades, though, a handful of curators strove to change that. They organized exhibitions, wrote books, advised collectors and generally pushed to elevate Indian art to its rightful place in art museums. Among the most influential was Ralph T. Coe (1929-2010). "Ted" Coe, a scion of a wealthy Ohio family, grew up among Impressionist art. He earned degrees in art history from Oberlin and Yale, worked as a research assistant to the great Sir John Pope-Hennessy at the Victoria and Albert Museum in London, and on returning to the U.S. became a curator of European art and eventually the director of what is today the Nelson-Atkins Museum of Art in Kansas City. Curator Bruce Bernstein—the Foundation's executive director—begins with an introduction to Coe and then attempts to organize the objects around the themes of three important exhibitions. Coe's landmark "Sacred Circles: Two Thousand Years of North American Indian Art," asserting the artistry of 670 historical objects, opened in 1976 in London. In 1986, his "Lost and Found Traditions: Native American Art 1965-1985"—which argued that Indians continue to produce vibrant art, not just touristy pieces—opened, tellingly, at the American Museum of Natural History in New York. Then, in 2003, "The Responsive Eye: Ralph T. Coe and the Collecting of American Indian Art," went on view at the Metropolitan Museum of Art the Met, consisting of the 200 works he had promised to the Met. A final section documents Coe's friendship with Joyce Growing Thunder Fogarty, a renowned Assiniboine–Sioux bead and quill artist. What is clear throughout is Coe's eye—his ability to choose the best after studying pieces (informed by his knowledge of art history) and, as he once wrote, coming to understand them. His connoisseurship apparently knew few bounds: the wide array here comes nearly all over the United States and Canada (Mr. Bernstein excluded art by Southwest peoples, which is plentiful in Santa Fe). Moreover, while most works on view were made in the 19th or 20th centuries, more than a dozen were created in the 21st century and, most impressively, seven date to the 18th century. 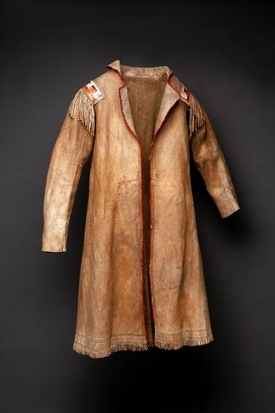 The earliest—and most important—is a smashing Cree or Ojibwa military-style coat, fashioned from moose-hide, with fringed epaulets made of colored porcupine quills, and a hemline stamped with circle designs and borders (above left). Dated c. 1740, it was made for European trappers. Nearby is a pair of Seneca (attributed) moccasins (c. 1860), fashioned with velvet bows on a commercial leather sole. Both remind us that cross-pollination between Europeans and Indians was far from unusual, a theme evident in the hearts and clubs that show up on the handle of a crooked knife (c. 1900); a beautiful carved argillite figure of a Haida woman dressed in a fancy European dress with full, draped sleeves (c. 1850); and a Mi'kmaq (attributed) Empire-style chair (c. 1870) with a patterned seat made of dyed porcupine quills and edged with alternating stitches of black-dyed and undyed spruce root. Visually speaking, the beaded clothing seems the most powerful. 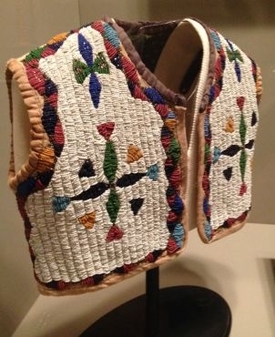 An Omaha (attributed) child's vest (c. 1880)—probably intended for a boy chief or dignitary's son—bears colorful symbols of the four directions on the front; three lambs run down the center of the back, surrounded by four roosters (below, left). The background beads are white, and the edges are trimmed with a rope-like pattern dominated by yellow. A stylish Mi'kmaq woman's woolen hood (c. 1875) also stands out. It is trimmed with silk ribbon and glass beads arranged in a curved motif that, the catalogue says, "probably derives from ancient Mi'kmaq art." Few of these fragile hoods have survived. Beading traditions and patterns shine just as brightly in contemporary works. 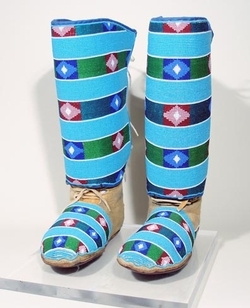 Crow Indian Maggie Pickett–Yellowtail (1894–1956) created a show-stopping pair of moccasins and leggings (c. 1945)—fine bead work that blends an azure background with horizontal, diamond-patterned stripes of green, blue and pink (at right). Not too far away, Ms. Fogarty's stunning dance shirt (1988), made from bright red hand-dyed wool, adorned with a beaded medallion and trimmed with ermine tails and leather fringe, occupies a place of honor. Her much smaller doll's shirt (2000), of white leather and fringe, decorated with turquoise beadwork, is one of several other outstanding objects by her. At times, the exhibit provides the opportunity to compare traditions. In one case, there's a parade of moccasins—19 pair, including mukluks and leggings—that date from 1840 to 1990 and were made by Nakota, Otoe, Eastern Ojibwa, southern Cheyenne and other artists. Another shows 14 crooked knives, dated 1780 to 1900, made by Maliseet, Iroquois and other tribes. Occasionally, viewers can trace continuity across centuries. Most notably, a Hupa purse (1875) made of elk horn, plant fiber, and colored with pigment, sits beside a purse made by Hupa artist George Blake around 1987. His consists of elk horn and leather and colored with black paint. They are much alike. But there, and in many other places, I would have liked more explanation. The wall labels in "Connoisseurship and Good Pie" are sparse—mainly opening each section. Objects are accompanied only by a one-word description ("purse"), then tribe, artist's name (if known), location, material and date. The galleries are too crammed for each object to have a 150-word label (a standard at many museums), but perhaps some for the best pieces? Wouldn't viewers like to know that the marvelous child's vest was probably made for a boy chief? They would have to buy the catalogue. That quibble aside, this exhibit is testimony to the ability Coe had to train his own eye—and an invitation to viewers, too, to look hard and find the art in Native American objects. This review appeared in a shorter version in The Wall Street Journal.